It seems that Nintendo weren’t only interested in 3D for their newest handheld, but also for the Wii U. Patents filed in September 2011 by the company talk about how the MD (mobile display), in other words the controller screen, may have a 3D display. The patent also hints at 3D output to an SD (standard display) such as a television screen. It seems unlikely that the final controller will have a 3D display but it’s interesting to see that Nintendo had considered including it. Another patent hints that Nintendo was also considering a HD display for the controller. This seems the more likely to happen between the two, but it is unlikely that the controller will change its form now. Would you have liked to see these features in the Wii U’s controller? It would be awesome to have a 3D display on the controller… If it’s true, there’s hope for a 3DS Player for it. I hate the fact I keep hearing Microsoft is doing a tablet kind controller next. I thought Bull crap so summit like this should be done to make sure they wont do as better. The new “Google Entertainment System” is also allegedly going to use an android device to use as a remote, which means a touchscreen controller! This seems to be the way it’s going, although Nintendo remains the touch champ, what with releasing the DS far before anything like the iPhone was around to my knowledge, and announcing the Wii U before Google announced it’s thing or Microsoft might announce it’s touchscreen console. Of course, when we look back at the rumors about the eReader and the iOS apps, the Wii U might end up being the best of both worlds. The controller doesn’t really need a hd screen in my opinion but it’s not an impossibility it will end up that way. hd display with multitouch screen like and ipad like seriously they need to wake up and add this! Jonathon i will be applying to the UN to have people like you life banned from gaming could you enlighten us to how a lagging rubbish non stylus screen is in any way beneficial to gaming ! HUH? multi touch screen controlled gaming on ipad is a casual stupid joke virtual buttons are crap as is virtual analog and d-pads multi touch is a gimmick for phones LOK FOLKS I SWIPPED THE SCREEN WITH 2 FINGERS AND MY YOUTUBE VIDEO BOX GOT BIGGER WOW WEE hint hint!! all of this is ether imposable or extremely laggy on a multi touch screen CORE GAMING FACT! play games on any smart phone or pad with multi touch the controls are a sad joke you clearly have zero knowledge of what gaming is…. The primary reason why people don’t use multi-touch screens a lot is because they tend to need to be calibrated a lot more than single-touch touchscreens. Multi-touch screens get thrown out of sync easier, makes game programming a bit tougher for programmers, and in the case with bigger touchscreens, multi-touch typically aren’t too useful for gaming in most situations given that you usually need one hand to hold the controller as you use the other hand to operate the touchscreen. While an iPad can be laid down and played with, and since it relies 100% on touch-based functions (for both iPad games and daily-use apps), it can afford to sport multi-touch. But a Wii U controller is meant to be held in your hands and typically used in conjunction with the buttons, so single-touch is sufficient for its needs. Chill out and cool down, dude. It’s not that serious, man. It’s all good, guy. It was just his opinion, not a mandate. Does multi-touch do anything than than let you zoom in and out? I’ve never seen it used for anything but that. It’d be a waste of time and money, if the game has something to be zoomed in on the tablet screen then the dev could just put a slider or a zoom button on the display. 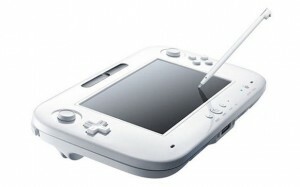 I think Wii U will use DS like touch screen with controllers analog stick & buttons. It’s better than any multitouch control setting i have seen this far. In Ipad/Iphone/etc. you must have multitouch for gaming because you don’t have real analog stick or buttons. Try to imagine playing Contra or Mario with multitouch only and you see that it’s not so smooth. If Nintendo was smart (and I think they are), they’d continue just the way they are with the Wii U controller and not worry about Microsoft and Sony copying them. Why? Because if they do copy Nintendo, Microsoft and Sony are bound to add HD and/or 3D to their imitations, and, well, it just won’t work as well as the simplicity of the Wii U controller. Right now, adding multi-touch, 3D or HD to a console controller’s screen just wouldn’t be the best idea for this next-generation. They’d make the console cost too much in terms of performance and price. But you can bet that Microsoft and Sony will likely go ahead with implementing such anyways. They might find some success with it, but, for reasons I listed in my comment below, it’s not likely. So I say, let them copy Nintendo. It’ll be their loss if they do. If the only use of the “MD” was to display 2D graphics, like in most 3DS games, a low res display would not be a problem. But as it is planed to use it for advanced graphics and gameplay, maybe a ~960×540, half the “SD” res, would be better. 3D display would be gorgeous! But switching constantly between the couple of screens going to give many headhache. An HD display would be awesome!!! just a wii bit of commonsense for those embarrassing ones amongst us that dont have the foggiest idea what there talking about…. right here goes im sorry il be embarrassing you but it had to be pointed out..
An HD or 3D (or even an HD 3D) touchscreen on the tablet would be neat, but I think they’re wise in not including it, at least in this final design for now. I would imagine that featuring HD or 3D would drain the controller’s batteries too quickly and take its toll on the streaming between the console and the controller. This is just how I would’ve liked to see haptic-feedback technology on the touchscreen, where you can literally feel textures on the screen, but for the same reasons, I considered that it probably wouldn’t be for the best. Not to mention that any such feature as these would make the Wii U itself cost more. Also, it’s a fact that touchscreens and 3D technology just don’t mix well at this time in technology. The fancier the feature, the more it costs in performance and price. I would rather see Wii U support at least two Wii U controllers as they currently are than support one super-fancy Wii U controller. But it’s still cool that Nintendo has been keeping their mind open towards its design. I like seeing these comments about the pros and cons of using HD and 3D on the new tablet. I mean, with those aside, developers should already have plenty ideas with how to make this thing super fun. Surprised that no one mentioned the slide pads…. Should they just put dual analogs on there with a click function? I was talking to a friend about this and he pointed out something very interesting. The right slide pad seem to be strategically placed above the buttons for easy/simultaneous access. Similar to the the bean buttons on the gamecube controller (you could literally press all 3 of the A, Y, X buttons at the same time). If a dual analog was there it would not be possible, because your thumb finger is lifted too far from the controller, thus the implementation of a slide pad. Maybe we were looking at it too analytically LOL. I thought it was interesting. who knows that could be the very reason why it was Nintendo went with circle pads. Holy crud, i think you’re on to something huge. This allows for use of the face buttons and “claw control” at the same time. I’m not sure any dev is willing to take the chance to make a game based around that because it sounds pretty complicated (and heck, it might be) to have one thumb do all that work. However, in games with custom buttonmapping like Smash, you better bet i’ll be using/abusing this. And if a developer makes a kicking title that makes strong use of this? Microsoft and Sony are going to have to rethink their own controllers, and may bring more innovation to the table while they’re at it. Sorry for the double comment, but i just pulled out my 3DS and placed my thumb on the circle pad. The bend of my thumb hits the D-Pad. Perfectly. Nintendo understands controllers better than any company on the market, as evidenced by their extremely ergonomic Gamecube controller, the diamond buttonmaps on the DS and 3DS being covered by one thumb, all the brilliance that went with the Wii controller as soon as it stopped being a pointer, and now this. I can’t imagine 3D being implemented into the screen as when a 3D screen gets marks on them the display is badly affected, like when you get finger prints or something on the 3DS 3D screen. And with the HD aspect a screen of that size really doesn’t need HD. All HD or 3D would do is needlessly increase the price. Nintendo are the ones who always get copied, the fact that they’re working on 3D for the screen isn’t copying Sony, Nintendo were the first to have a 3D console. Although the Vita is 720p HD it doesn’t mean Nintendo are copying Sony, it just means that they’re using HD like every console/computer/phone/tablet etc. is using these days. Yeah and from what you said wouldn’t Sony of copied Microsoft with HD since the Xbox 360 was the first HD console. The PS vita isn’t 720p. 720p is 1280×720. The vita is 960×545. actually MS followed sony , ms was going to go with 256mb ram not 512mb and 480p + rendering and use the 10mb edram for AA and strong framerate x360 was supposed to be a 480p to say 576p 60fps monster console they layer went HD and 512mb ram the whole before ps3 was RUSHED to release to gain a years head start xbox 1 was only 4 years old…. If it’s possible passive 3D made by WiiU’s software could be nice add. Passive 3D glasses are pretty cheap so the price shouldn’t be big issue. HD for controller is always better than no HD if it doesn’t make console cost too much for customers. It’d make more sense to have the 3D display like the 3DS. A 3D screen isn’t very expensive, and given the Wii U will be capable of displaying to two screens at once, having an option to only display on the controller for 3D would be easy to do, and the result would be pretty, if smaller than displaying on your big screen TV. Why do you people want HD on a tiny controller? The resolution they gave us at e3 is more than enough for it to look stunning. Please stop confusing the term “HD” with anything but resolution. I don’t know if it’s too late for them to change the controller features just yet. Personally, I think 3D screens could still be a possibility. We’ve heard from several industry folk that they have made some major changes since last years E3 debut. When they re-reveal the Wii-U, or whatever it’s going to be called now, at E3 2012, it may look very different. -and multi-touch, although not completely important, could prove quite useful, if it’s to have any kind of realistic web browser. This is just Nintendo’s way of ensuring that no one else attempts to profit off those features. The patent for hd seems silly for me. What if you have an hd android tablet and some writes a controler app. It could be very easy to violate this patent even if the device manufacturers didn’t intent to violate it. Who would be responsible for the law suite, because the manufaturer would only be making and hd device, the programer would only be writing controler software, the user would be using what was aready there.